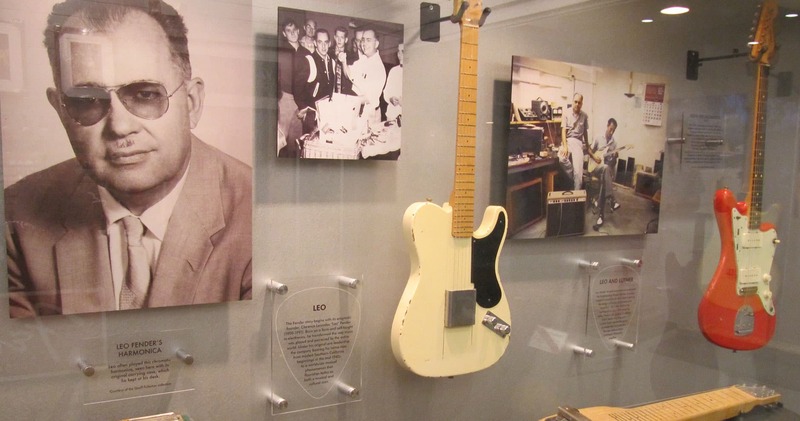 Almost everybody in the world has either seen or heard a Fender electric guitar, but not everybody knows about Leo Fender: the man behind the biggest guitar brand on the planet. In this article, we’ll take a look at the trials involved in designing some of the most iconic guitars of all time! Note: to avoid confusion, we’ll be referring to Leo Fender as Leo, and to Fender Music Instruments Corporation as Fender! Here we are, more than 60 years since Leo Fender first revolutionised the guitar, and players are still wringing new sounds out of his creations. The Jim Root Stratocaster, the Johnny Marr Jaguar, the Brad Paisley Telecaster; they all serve as reminders that the early Fender designs are as diverse and adaptable as ever, with a near-unrivalled ability to be tweaked and refined for different musical purposes. Despite this extreme versatility, they still bare Leo’s distinctive design traits that helped put Fender on the map all those years ago. Despite the enormous popularity of his guitars, Leo’s designs weren’t without their problems. It took a great deal of trial and error, tests, setbacks and rethinks before the guitars that we know and love found their way onto the mainstream market. Even after Leo left Fender, he continued tweaking and refining his designs with Music Man and G&L right up until his death in 1991. Leo famously didn’t actually play guitar, although he understood the importance of surrounding himself with those who did. One such person was Western Swing guitarist Bill Carson, who suggested the body relief cuts that made the Fender Stratocaster more comfortable than the slab-like Fender Telecaster. Much of Leo’s drive to create was informed by the music he wanted to hear. As devoted fan of country music, much of Fender’s early success was driven by Leo’s desire to provide instruments for the genre he loved. We were trying to get a tone like you get with the steel guitar, because a steel was so much cleaner in sound than an acoustic, Fender is quoted as saying in The Story Of The Fender Stratocaster by Ray Minhinnett and Bob Young. We wanted to have something that you could hear that had sustain and a lack of feedback. He cheekily added that the instrument had to be strong enough for musicians to use in a fight if they had to, noting: If you get clobbered over the head with one of those, you know you’ve been hit! One of Leo’s most influential inventions was the electric bass guitar; before Fender, there was no such thing. Bass was an imposing instrument that stood upright dominated the stage. With the introduction of the original Fender Precision Bass, it became something you could sling over your shoulder. Initially adopted by country guitarists, it wasn’t long before the electric bass became a standard instrument for bands across the globe. But not all of Leo’s design hunches were smash hits: he originally wanted to build necks without truss rods, believing them unnecessary in an instrument that was made well enough. He also felt that the act of channelling out a neck and installing a truss rod would impede the instrument’s natural sustain. A handful of models were made without truss rods in the early ‘50s before it was decided that the extra care needed to create such a stable neck without reinforcement was too time consuming. The vibrato bridge, a crucial aspect of the Strat design, took a while to perfect too. The initial design was similar in spirit to Paul Bigbsy’s famous bridge, with a moving tailpiece and roller saddles. But the unit was so lightweight that it pretty much killed the ability of the string energy to transfer to the body, and the guitar sounded awful. As Bill Carson says in The Story Of The Fender Stratocaster, I took this guitar to a job, hooked it up to play it, and it sounded like a cheap banjo, the sound decayed so quick. Carson phoned Leo Fender and Freddie Tavares to complain that they’d killed his pickups, only to be told that the pickups weren’t touched. It was a valuable lesson in the interaction between the mass of the tremolo system and the transfer of string vibration. $5000 worth of custom tooling was scratched and Fender went back to the drawing board. It was Carson again who suggested six individual saddles for the Stratocaster bridge. Initially, the screws were adjusted from the opposite side to where we perform this action today: on the pickup side of the bridge rather than the back. This made it almost impossible to intonate, so it was flipped 180 degrees. Carson also says he was behind the decision to switch from two pickups in the Fender Telecaster to three in the Stratocaster – though he wanted four! Some of Fender’s refinements were improvements in some ways but a step back (or at least sideways) in others. For example, the Telecaster’s original two-strings-per-saddle, three-saddle design was eventually superseded by a more intonatable six-saddle version. In theory, this meant that you had far superior control over your guitar’s action and intonation. In reality, players lost a little of the tonal mojo created by the interaction between the strings on each shared saddle. With each pair vibrating with the other, and on a much bigger saddle, the sound was fuller and snappier – more like the sound that we associate with the Telecaster. The change in saddle design meant perfecting the intonation but sacrificing a little character to do so. Like any great inventor, Leo Fender wasn’t afraid to admit when he was wrong, but he also had the conviction to doggedly pursue his ideas when he felt that he could be ‘more right.’ This outlook was what led him to co-found the Music Man company in the mid ‘70s, and G&L Guitars with George Fullerton in 1979. Check out Parts 2 & 3 of our Leo Fender feature for the full story! Did you enjoy reading this insightful article? Leave a comment below and share your thoughts!